Please read our Terms and Conditions before booking your transfer. By booking our transfer or service, you fully accept out Terms and Conditions, and you are legally bound to them. This User Agreement and its provisions are regulated by the Italian law without regard to conflict of laws provisions that would result in the application of the laws of any other jurisdiction. After the booking procedure, you will receive our confirmation email for the requested transfer . In case no vehicle is available, you will be informed by email. The vehicle model and type reported in the reservation form and on this website are only aimed at illustrating the type of service. In some rare cases the service provider may provide a replacement vehicle in order to fulfill the service request. For instance, in case the reserved car is delayed because of traffic jams, deviations or for other reasons, suitable substitution vehicle will be provided at equal or higher price. We cannot guarantee that the exact vehicle type or model specified in your booking confirmation will be used for your service. If you choose the "Pay directly to the driver" option, the credit card details provided during the reservation procedure will only be used to confirm and guarantee your booking, and no amount will be charged on it. Your credit card may be used to charge, without previous notice, any applicable penalty according to Par. 5 of this User Agreement and to cover any expense in case of damage to the vehicle. You acknowledge and confirm to be the holder of the credit card provided during the reservation and that it has sufficient coverage for the service booked. c) 100% of the transfer cost shall be charged in case the cancellaiton is made after the driver has left to the agreed meeting point or in case of customer’s absence at the agreed meeting point. a) Pick-ups from airports and cruise terminals: 60 minutes from the actual flight or cruise ship arrival time (as showed on the airport/cruise terminal information displays). In case the driver is not contacted by the customer after this time, he/she will leave the meeting point and a cancellation fee equal to 100% of the booked service price will be charged on the credit card provided during the booking procedure. In case of customer’s absence without any previous notification, 100% of the booked transfer cost will be charged on the customer’s credit card provided during the booking procedure. In case we need to cancel your booking, we will inform you as soon as possible by email by suggesting, if possible, other applicable options. Our company reserves the right to cancel any booking for whatsoever reason. No refund shall be due, except for a 100% refund in case of prepaid reservation. In order to ensure the best service and to provide you with the most suitable vehicle , we kindly ask you to inform us about any over luggage or special items (odd shape, heavier or bigger than usual, including, but not limited to: strollers, wheelchairs, scuba dive equipment, bikes, golf bags). You shall be debited with all the eventual costs for additional or different vehicles needed to carry the luggage or special items that you did not mention on thebooking form. Fiumicinoairportshuttle.com shall not be held responsible for any delay, modification or cancellation of service caused by unpredictable circumstances beyond the its control, such as accidents incurred by third parties during the transfer, normal or high traffic, acts of terrorism, strikes, police checkpoints, difficult weather conditions, detours, natural disasters, road maintenance works, etc. 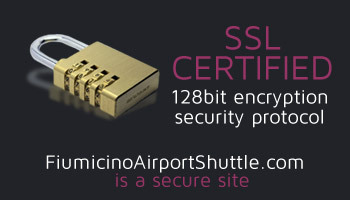 Trademarks, copyrights, and other intellectual property rights of this website have been granted to Fiumicino Airport Shuttle and are protected by national and international regulations governing the intellectual property rights. The use of any content of this website by third parties for any purpose other than transfer booking is forbidden, including modification, subsequent publication and total or partial reproduction or representation of it without the express consent by Fiumicino Airport Shuttle.